With crime on the rise and criminals increasingly techno-savvy, laptop owners have to be ever careful and wary. 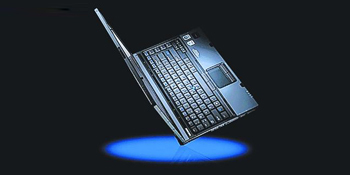 Laptop thefts can be devastating not only for the financial loss, but also the loss of important documents and files. HP Compaq has an answer to this dilemma. The HP Compaq NB6910 is a dream laptop for protection against crime. Equipped with a fingerprint reader, password protection functions and a two-factor authentification system (via USB tokens or smart cards), the NB6910 gives its owners peace of mind. It is medium in size and weighs slightly more than two kg. It complements the serious and elegant look of the professional businessman or businesswoman on the go. It has an Intel Centrino Pro 2.2GHz processor with 1GB DDR2 SDRAM. It also comes with a140GB hard disk. It has an ATI Mobility Radeon graphics chipset which has 64MB video memory. The battery lasts for an average of 130 minutes. The HP Compaq NB6910 carries all the standard office applications including complex spreadsheet calculations. The weary businessmen can also get some entertainment from this machine. It has a DVD-R/RW and a 14.1-inch widescreen display which allows satisfactory video-viewing pleasure. Priced from $2,799, this notebook is designed with business people in mind – secure, light, efficient and travel-friendly.